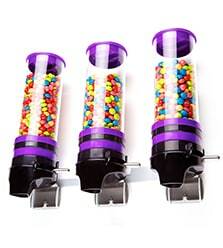 Using the latest ink injection technology, we can color any part of the dispenser, both plastic and metal, in the color of your choice. By including your logo and matching the colors and texture with those of your company, your business will increase brand exposure which preserving and reinforcing its brand identity. 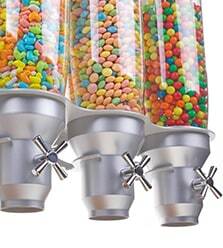 Our flexible manufacturing processes enable us to craft a dispenser with a storage capacity fit for your specific needs. Whether you have a busy restaurant that requires extra large storage, or you simply wish to provide your employees with an original holiday gift comprising a personalized small dispenser for their home, IDM can deliver the perfect useful dispenser that will last a lifetime. 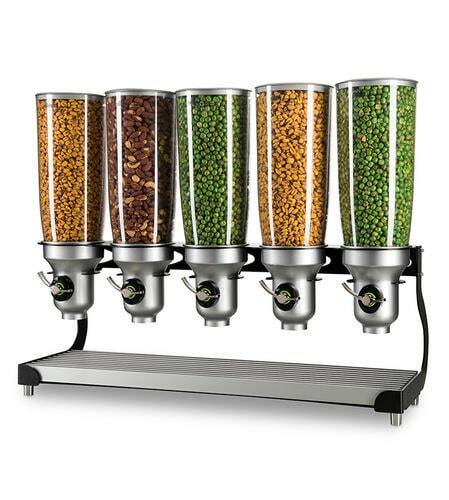 IDM specializes in one thing – developing and manufacturing best of breed dry food dispensers. Over the past 20 years, our company has acquired deep knowledge and understanding on the mechanics that work best with each type of dry food, such as powders, cereals, candies, to name just a few. If your business is seeking an optimal solution for specific types of dry foods, we welcome you to contact us for free consultation and a price quote (minimum orders may apply). 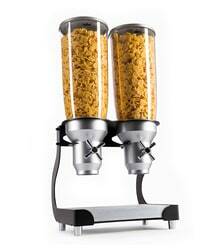 IDM offers its wide selection of dry food dispensers with either the IDM logo or a customized client logo. Contact us to inquire about your company logo inscription on any of our leading products.